This week’s theme is lawn care and gardening, patio furniture and decor, and kitchenware. 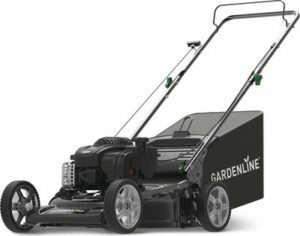 Gardenline 21″ 3-in-1 Gas Lawn Mower, $169.99. This features a Quick-and-easy Prime ‘N Pull™ starting system and a Briggs & Stratton® 500e Series™ 140cc Engine. Check out our roundup of some of Aldi’s spring lawn care products here. Gardenline Garden Utility Cart, $59.99. Features a 500-lb. weight capacity. Measures 18″ x 34″ with a steel mesh deck with removable rubber mat. Gardenline 20V Cordless Blower, $39.99. Uses a 1.5-Ah lithium-ion battery. Gardenline 20V Cordless Trimmer/Edger, $39.99. Compact design with Telescopic Shaft. Read our review here. Gardenline Multi-Purpose Sprayer, $6.99. Features a 1-gallon capacity. Spectracide Weed Stop or Bug Stop, $4.99 for one gallon. Gardenline Children’s Garden Tools, $3.99 each. Gardenline Ladies’ Garden Boots, $12.99. Sizes 7-10. Read our review here. Gardenline Touchscreen Gardening Gloves, $4.99. Suncast Hose Hideaway, $39.99. Slide Trak® fits 175′ of 5/8″ hose. Gardenline PRO Series Hose Nozzle Assortment, $7.99 each. One of these nozzles didn’t work well for us last year. Read our review here. Gardenline Heavy-Duty Kink-Free Garden Hose, $16.99. Read our review here. Gardenline 18″ Resin Wicker Planter, $12.99. Keter Rattan Sphere Hanging Planter, $12.99. Measures 13.8″ in diameter. Tulips, Lilies, or Hyacinths, $3.99 each. 6″ Azalea or Hydrangea, $7.99 each. Assorted colors. Gardenline 9′ Aluminum Umbrella, $26.99. Features three-way tilt canopy. Gardenline Wicker Style Umbrella Stand, $19.99. Fits umbrella poles up to 2″ wide. Gardenline Rattan Storage Accent Table, $29.99. Features hidden storage and removable tray lid. Gardenline Steel Mesh Chair, $19.99 each. Easy to stack and store. Gardenline Seat Cushion, $6.99 each. Gardenline Steel Mesh Dining Table, $34.99. Folds for easy storage. Gardenline 80 Gallon Deck Box, $49.99. Weather-resistant. Gardenline Chair Cushion, $12.99 each. Weather-resistant. Crofton Platter or Bowl Assortment, $6.99 each. Crofton 4-Pack Glassware Assortment, $3.99 per pack. Choose 15.75-oz. tumblers or 15-oz. stemless wine glasses. Crofton 20-Piece Flatware Set, $16.99. Crofton 4-Pack Appetizer Plates or Bowls, $3.99 per pack. Crofton Stainless Steel or Copper Hosting Utensils, $3.99 each. Huntington Home Spring Tablecloth, $5.99. Assorted styles. Crane Adult Packable Rain Jacket, $14.99. Sizes S–XL in assorted colors. Easy Home Vinyl Padded Folding Chair, $14.99. Easy Home 5′ Fold-and-Roll Table, $29.99. Simply Nature Fresh Family Pack Organic Grass-Fed 85/15 Ground Beef, $4.49 per lb. Sold in a 4-lb. pkg. for $17.96. Fresh USDA Choice Eye of Round Roast, $3.69 per lb. Maynard’s Pink Port, see price in store. 500 mL, from Portugal. Aldi states: “Attractive floral notes and aromatic red berry fruit aromas. The palate is full of deliciously ripe cherry and raspberry fruit flavors. A perfect drink to accompany light appetizers, fresh fruit salads or for cocktail creations.” Alcohol Content: 19.50%. Crane, Crofton, Easy Home, Gardenline, GroundSmart, Huntington Home, Keter, Simply Nature, Spectracide, Suncast. Bookmark.